In May, I visited Haiti’s Central Plateau, including the community of Thomonde, to try and understand the extent of the challenges facing this region. 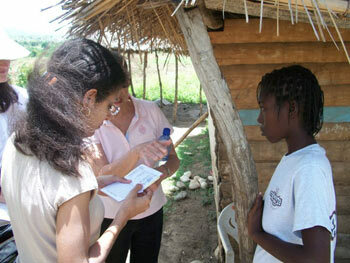 My visit to Haiti made me aware of just how much work there is to be done. But I also saw incredible resilience. I met an HIV positive woman, in good health because of the free medication she has received. She wants to do more to help the other women of her region … but what can she really do when the unemployment rate is over 70%? Another woman with no means of subsistence received three small goats, which she successfully breeds. This provides her with income, but her money is eaten up by expensive medical care for her daughter. This is the cycle of poverty; some individuals do work, but their health problems force them to spend all their income, leaving the family destitute all the same. Then there are the people who are in good health, but have no job opportunities to help them escape their poverty. Fighting cyclic poverty by working to combat problems of health, nutrition, education and financial independence: this is the essence of KANPE, dedicated to supporting these individuals in their quest for the financial self-sufficiency that will let them live their lives in dignity, a desire visible on the faces of everyone I met when visiting Haiti.